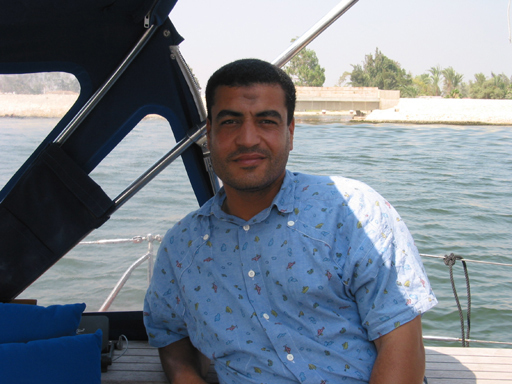 The Suez Canal marked a mental point-of-no-return, once south of the canal the commitment was total. In actuality the canal goes both ways and a return to the Med is possible at any point. The transit takes two days for vessels like Callisto with speeds of less than 12 knots. 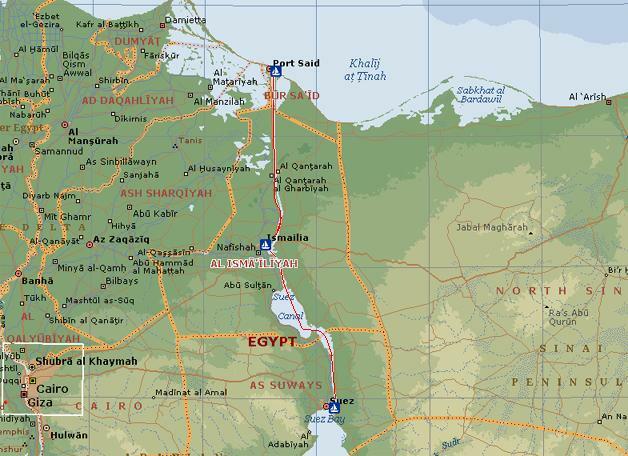 At the end of the first day is we stopped at Port Ismailia and then on to the southern terminus at Port Suez. All vessels transiting the canal are required to have a pilot on board. On 19 June the pilot boarded and we headed south. 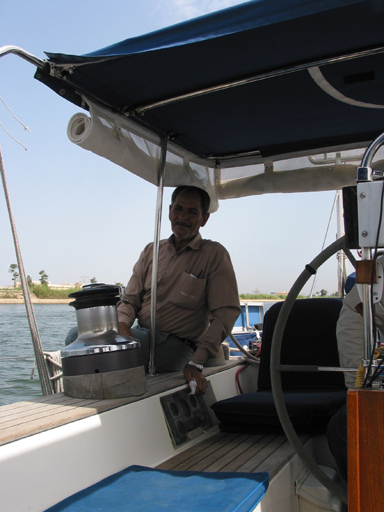 Within the cruising community there are numerous stories about obnoxious Suez Canal pilots. Fortunately, we are unable to add to this body of lore. The first pilot, pictured here, was a kindly gentleman who was friendly, did his job and caused no distress. There was a bit of a problem at the start because we had been warned by many canal veterans that it is common for the pilots to require you to stop at the various control stations along the canal so their friends at the station can pressure you for baksheesh (bribes). When the pilot said a stop was required at the first control station, Walt refused. The pilot was insistent, so a call was placed to Felix, the agent, and he confirmed that we were required to stop at the first station and hand in a crew list. Thank goodness for cell phones. Sightseeing is not the highlight of a canal passage, for that matter there is nothing particularly noteworthy about the passage. It is long day of motoring and hand steering with Walt at the helm. Fishermen like these were everywhere along the canal. It never ceases to amaze that there are any fish left in the seas given the number of people stringing nets, setting traps and running trot lines in all the worlds waters. 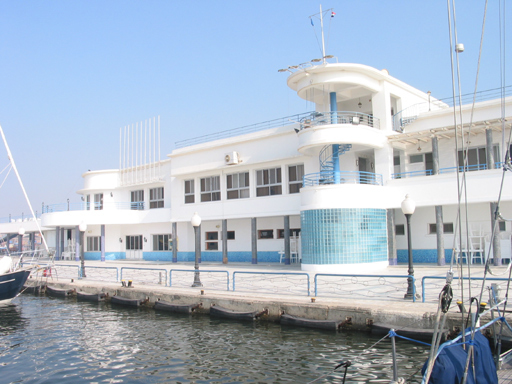 Port Ismailia is about half way along the canal and is the place you stop at the end of the first day. 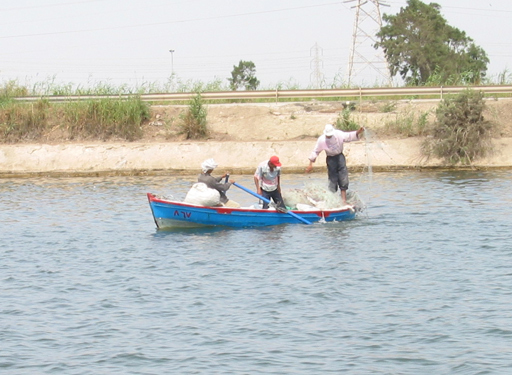 It is an interesting town from the aspect that it is a Nile Delta town, but not a big tourist draw. It lacks the grubbiness of Port Said and the hustle-bustle of Cairo. 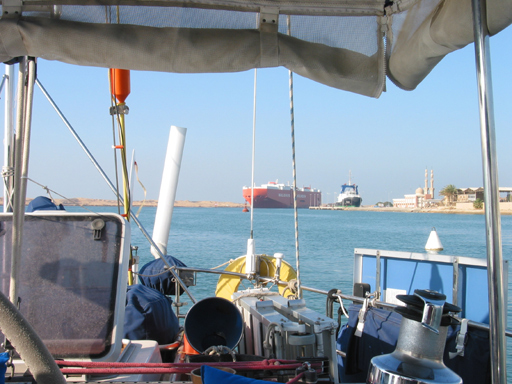 Slower vessels such as ours always follow the last ship in the convoy so the day of departure from Ismailia is somewhat more leisurely. We were underway about 0930 and tucked in behind the tail end ship. At mid-day the entire southbound convoy anchors in the Bitter Lakes for about three hours while the northbound convoy passes. This break gave the pilot time to do his ablutions and mid-day prayers and gave the steersman a break as well. The pilot for this day was a younger man and more reserved. We were not sure if he was uneasy being on a US flagged vessel or just uneasy being on a non-Islamic vessel or if he was just more taciturn. In any case he showed no outward hostility and was always polite. He did refuse to eat our food fearing, we are sure, that it might not be halal. Even though nothing was served that would be offensive to a Muslim. He had intended on fasting for the whole trip, but by midafternoon gave in and accepted cheese and crackers. It was 1930 by the time Callisto was moored in Port Suez, at the north end of the Gulf of Suez and the gateway to the Red Sea. We were through the canal, another milestone passed, tomorrow fuel would be loaded, but tonight it felt good to have a quiet dinner in the harbor and tuck in early.